Local Indianapolis sports news from January 1-2, 2018, straight from the source. 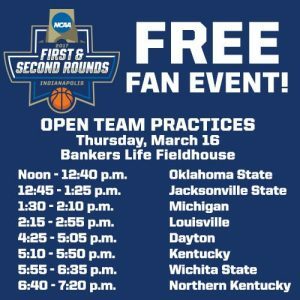 Head to Bankers Life Fieldhouse before the games tip off for a public open practice on Thursday, March 16 from noon to 7 p.m.
1st Round TV Schedule for the 2017 NIT Basketball Tournament. Order Pizza Hut From Your Shoes? Just in time for college basketball’s signature event, Pizza Hut, the Official Pizza of the NCAA, March Madness and the Final Four® has taken its digital ordering experience to the next level with Pizza Hut Pie Tops. Be sure to catch the following Butler, Notre Dame, Purdue & Indiana Men’s Basketball games on TV this coming week.